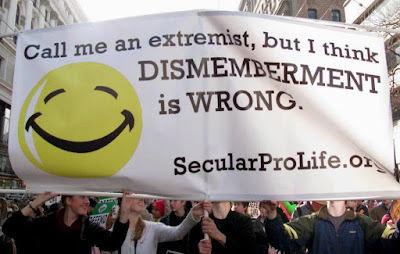 Secular Pro-Life Perspectives: Apparently protecting embryos is more extreme than severing babies' spines. Apparently protecting embryos is more extreme than severing babies' spines. Pro-choice activists mock the most socially unpalatable aspects of the pro-life position. Broadly speaking, pro-lifers believe human life is morally relevant when the human organism begins: as a zygote. 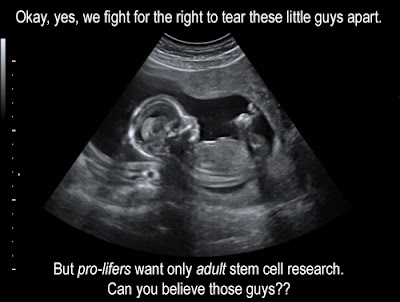 This means we oppose killing not only fetuses, but also embryos and zygotes. And so, while we primarily object to surgical abortion, many of us also object to embryonic stem cell (ESC) research, contraception that prevents implantation, and aspects of in vitro fertilization (IVF)—all processes the public tends to be a lot more okay with than abortion. Pro-choicers like to emphasize these objections, implying or outright saying we’re out-of-touch zealots with whacked priorities. They paint a dystopian picture where women can’t access the most common forms of contraception, people keep suffering from ailments ESC could have cured, and infertile couples have nowhere to turn. They usually go further and suggest we want people to suffer in various ways, or at least we are indifferent to suffering as we elevate the welfare of microscopic one-celled “seeds” over everyone else. I have plenty of problems with these assertions. It’s obnoxious when people ignore your stated motivation in favor of the secret more sinister motivation they’re sure you have. It’s equivocating to try to claim motivation is more about effect than intent. And the dystopian predictions require a whole host of assumptions beyond “zygotes are morally relevant” to actually come true. But what annoys me most is the hypocrisy. If zygotes are morally relevant, pro-lifers have to argue for socially unpopular opinions, like that certain forms of contraception may be immoral. That’s true. But if fetal life is morally irrelevant, pro-choicers have to defend (or, more typically, wholly ignore) socially unpopular realities, like that healthy women abort healthy fetuses 4 months into pregnancy and beyond thousands of times a year. They abort fetuses developed enough that Planned Parenthood can harvest intact organs. 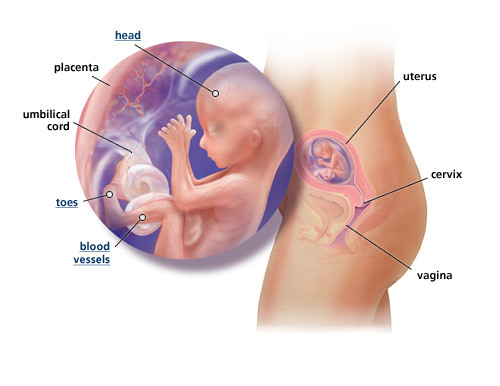 They abort fetuses developed enough to sometimes survive the abortion by accident. Moreover, when darkly predicting what pro-lifers want to do about contraception, ESC, and IVF, pro-choicers are theorizing about what could happen someday if XYZ factors come to pass. 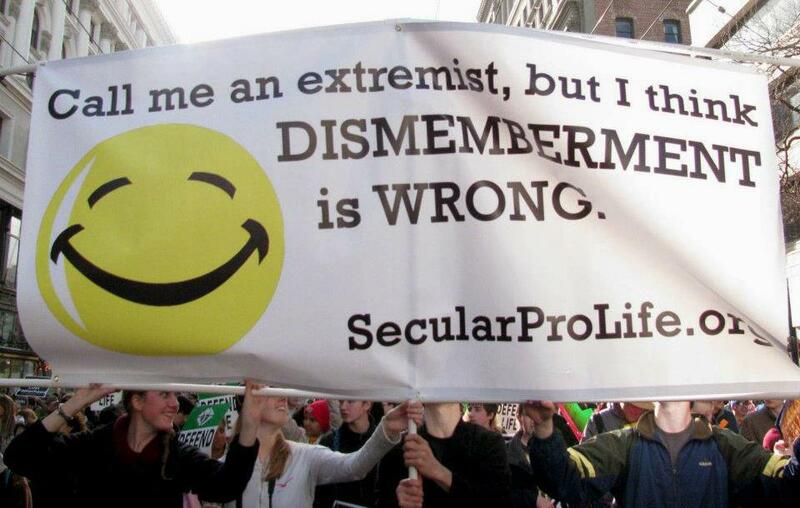 But the dismemberment of late term fetuses is happening now. It’s already a reality, and it’s not even a secret. 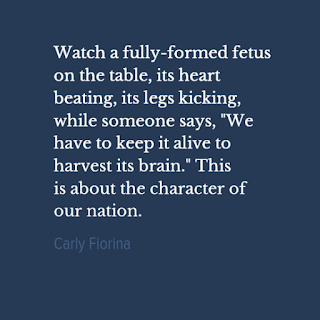 Remember last year when Carly Fiorina said this regarding the CMP videos? Fiorina got a lot of flack for allegedly making things up, but pay attention to the nature of the objections. People were quick to point out that the CMP videos never had a scene exactly as Fiorina described. So the objection was “There isn’t specific video footage of what she said!” The objection was not “Planned Parenthood never harvested the brains of fetuses who were developed enough to have a heartbeat or kick their legs.” You know why? Because Planned Parenthood has done that. They don’t even deny it. The entire CMP controversy is a great example of pro-choicers ignoring the most perverse aspects of the American pro-choice stance. The rampant accusations of edited footage and public deception all focus on whether PP profited in their exchange of fetal organs for money, not on whether they harvest fetal organs from late-term fetuses. They do. But sure, let’s talk more about what might happen with the copper IUD and ignore that we’re ripping babies apart. (Yes, I said “babies.” I get objecting to calling a zygote or blastocyst a “baby” because of the completely different imagery the word brings to people’s minds. But when I’m talking about fetuses at this level? The typical pro-choice defense here is that late-term abortions are due to fatal fetal abnormalities or threats to the mother’s life. It’s no doubt true that, proportionally, late-term abortions are more likely to be for those reasons than earlier term abortions are. But what research we can find indicates most late-term abortions aren’t done for those reasons. Pro-choice activists try to use heartbreaking stories of planned pregnancies gone horribly wrong to sidestep the more common scenario of healthy late term fetuses aborted in far less dire situations. For the most part Americans seem to take the “abortion is a necessary evil” perspective. On average, Americans think early term abortion ought to be legal but remain divided on its morality and resistant to late-term abortion. And yet we already have the regular destruction of fetuses who were so developed all but the most insistent pro-choicers would recognize them as babies. How much darker would things get if more of America moved from a pro-choice perspective to a pro-abortion one? We’re not even getting into what could happen if our society switched from “abortion: the necessary evil” to “abortion: the responsible, empowering, moral choice.” We’ve already had glimpses of that world, with issues like renaming "infanticide" as "after-birth abortion," claiming that "killing a newborn baby is never equivalent to killing a person," and resisting requirements to try to save the lives of babies who accidentally survive abortion. And this is what I mean by hypocrisy – pro-choicers bash us for being concerned about aspects of IVF, but what does the average American have a bigger problem with? IVF clinics possibly shutting down someday, or people tearing babies’ legs off now? Which worldview really has the extreme repercussions here? Note I’m not saying pro-choice people are all okay with late-term elective abortion. 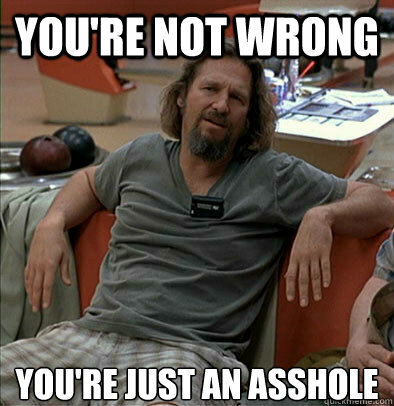 I think--and polls back me up--that most of them are pretty uncomfortable with it. But I am saying it’s a fact of the American pro-choice political platform. And late-term elective abortion isn’t the only extreme aspect of this platform. Do you follow that? What does it say about American abortion rights if they’re threatened by specifying legal protection to born babies whose parents had wanted to abort? Obama isn’t the only one who sees the problem. When Gosnell was found guilty of severing the spinal cords of born babies, some abortion rights supporters objected to him being charged with murder—because what he’d done was so similar to late-term abortion. You’d think this similarity would suggest a problem with late-term abortion, but apparently instead it’s a problem with how society reacts to killing born babies. We are through the looking glass here, guys, and it's not the pro-life side that pushed us there. I think the most relevant abortion debates take an unblinking look at early term abortion and discuss its many moral, legal, and social factors. But I don’t think every single abortion debate has to focus on only the most common forms of it. I think it’s fair to look at the trickier, less socially acceptable implications of a perspective (be it defense of zygotes or lack of defense of newborns). But if pro-choicers are going to scrutinize the edges of our side, they should have the courage to look as critically at their own.